You are either reading the first line of this after seeing the header and clicking to another page (possibly rolling your eyes), or you are salivating to find out more. This is the fate of bloggers during Fall who choose to go down the path of the pumpkin. Thanks for sticking with me until the next paragraph. I am really into the idea of pumpkin flavor, but rarely do I do anything more than bake/eat a pumpkin pie during the season. This year though I started thinking about syrups for drinks and really wanted to incorporate more Fall flavors on the site. And now it’s November and I haven’t a clue where those last few weeks have gone. Whoops. You’ll have to check in with me later for syrups, but what I do have for you now is some fantastic infused bourbon. And it’s the flavors of Fall, without all those gross artificial flavors you are probably accustomed to. Think pumpkin pie without the weird film that forms on the roof of your mouth from corn syrup. 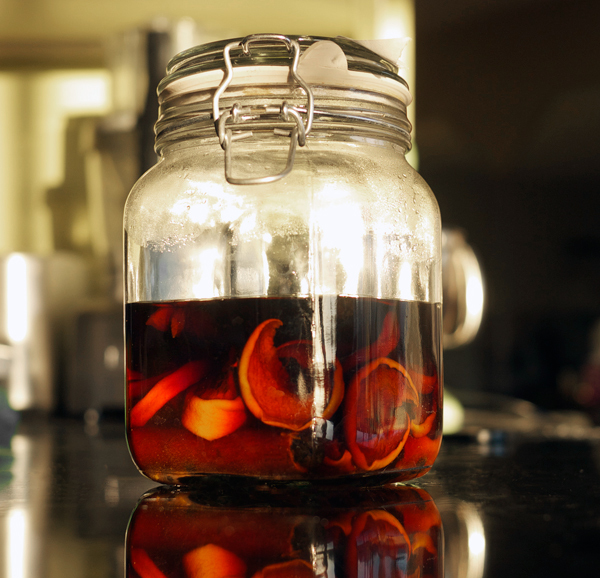 You know what is great about making infused booze at home? It’s a lazy man’s project. You just need time (FYI, make a calendar reminder as soon as you start your infusion. No forgetting about it after you stash it in a cool, dark place!) This one might be a bit more involved, but you could also make some great spiced-infused bourbon if the cutting and gutting (is that the correct terminology?) of a pumpkin is not your thing. I understand; knives can be scary. The recipe falls into two parts. Total time is about 2-3 weeks. 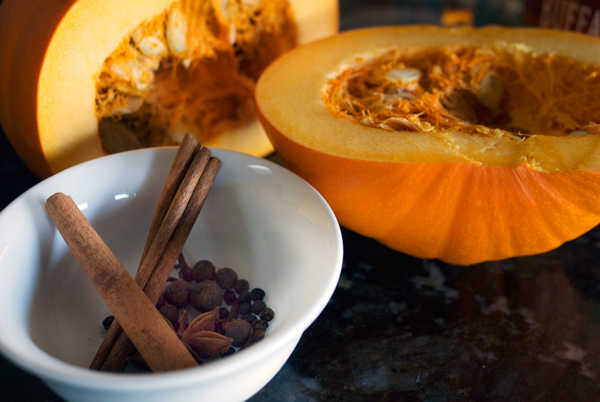 Dehydrate your pumpkin! Why? 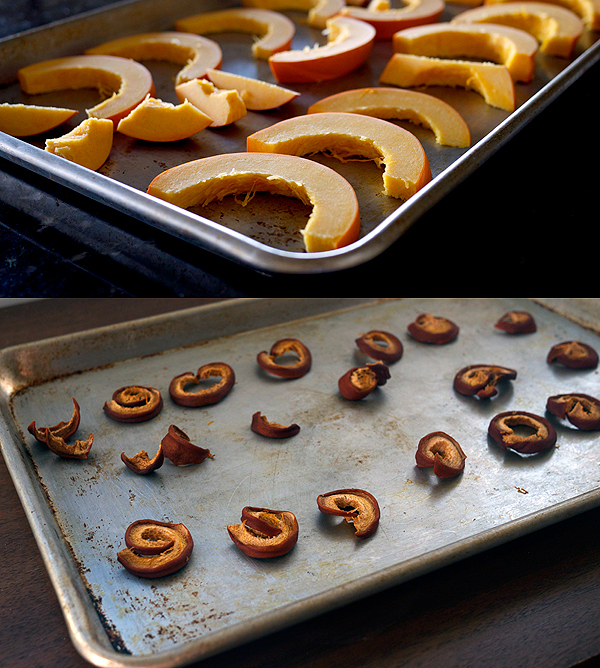 Dehydrating removes excess moisture from the squash and intensifies the “pumpkin” flavor. Heat your oven to 200°F. Cut your pumpkin in half from stem to bottom. Scoop out seeds (discard, or roast if that’s your thing. Personally I can’t stand them.) and slice into 1/2″ moons. Spread the slices on a baking sheet and move that to the oven. Wait six hours. Watch if you want occasionally. It’s like the Shrinky Dinks of my childhood. After 6 hours, turn the slices over. Bake another 6 hours. This will fully dry the slices out for infusion. Optionally, you can do this in a dehydrator. Follow the manufacturer’s instructions. Place all ingredients in an airtight container, glass would be best. Give the container a good swirl to make sure all ingredients are covered with liquid. Stick the jar in a cool, dark place for two weeks. After two weeks, strain all material out of the liquid using cheese cloth over a fine mesh strainer into a storage container (I reused the Buffalo Trace bottle). Taste the infusion. You have two options now. First, you can use as is. Second, bottle and wait an additional week to mellow out the flavor (I prefer the later). Why would you wait one more week? Right after discarding the solids the flavor of the infusion is quite sharp. Giving the infusion a week to sit let’s the flavors meld and mellow out. But this is entirely up to you. Like it sharp? Start using it now. What to do with this infusion? Well, for one, you can drink it over ice. It’s pretty much a flavor bomb of Fall smells. 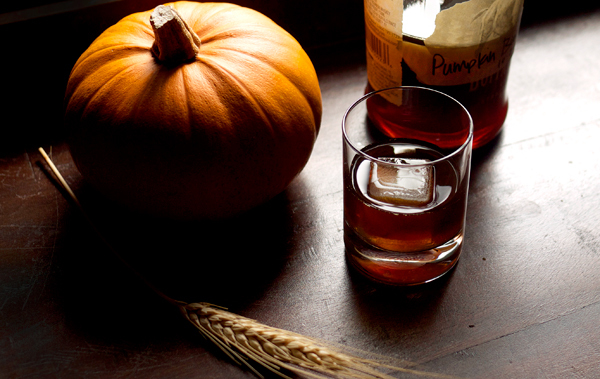 The sugar pumpkin has enough sweetness in it that it creates a nice balance with the whiskey. For those of you who want something a little less Fall tasting than just drinking Pimento Dram, this is for you. I’m going to play with this over the next week or so and see what I come up with for some cocktail suggestions. That gives you some time to start infusing. So get going! I LOVE this idea. I have been infusing my own vodka a lot but had never thought to infuse bourbon for some reason. Can’t wait to try it! Love to hear how it turns out for you!! We made this a few weeks ago, and it turned out great. I agree with the sharpness–it was better after sitting a week. Just wanted to share our favorite way of mixing it: with coffee and egg nog. The three complemented each other very well. Thanks for the recipe! Ooh! That sounds like a winning combination. Glad you liked it! Do you think this would work with butternut squash? Pumpkins are not that easy to come by here in Norway, and the ones you do find are huge! I think it would work. You’d get a different ‘squash’ type flavor though. I’d follow along the same directions and still dehydrate it. Let me know how it turns out! Only 2 cups of bourbon? That is not very much, especially waiting 3 weeks to enjoy. How much would I have to adjust the ingredients if I wanted to infuse a whole bottle? Well, 2 cups is about 2/3 a bottle and 750 ml is a little over 3 cups. I’d increase the pumpkin slightly (maybe another half pumpkin because sugar pumpkins are so small). And with the spices, I’d throw in another cinnamon stick, 1/2 tsp more peppercorns, and 1/4 tsp more allspice (which is like, 2 allspice berries if you have them whole). I would not increase the cloves or star anise since too much of either of those would make the liquid astringent. What if you have a dehydrator, will that take longer or shorter than the oven method? Unfortunately I don’t own a dehydrator so I can’t give you an estimate on time. If you have one though check the manufacturer’s site for times. Looks amazing. I got sugar pumpkins today in order to try this. It’s my first foray into infusions. Thinking of adding a vanilla bean. Too much? No, definitely not too much! Have fun with it! We made this, strained & rebottled it yesterday! We’re definitely going to let it mellow for at least a week (probably longer). I can’t wait to try it! We love pumpkins and we love whiskey, so after we were done rebottling the infused whiskey, I began thinking “It’s nice to drink a pumpkin & whiskey concoction… but what about EATING one?” So after we were done, I took the dehydrated pumpkin that the whiskey had been sitting in and put it into a food processor with some water. And voila! I had a whiskey/pumpkin puree. I used that puree in a pumpkin bread recipe and it turned out shockingly delicious! I used half the batter for a loaf of pumpkin whiskey bread and made 2 dozen muffins and 20 mini muffins. In short, that small pumpkin went a long way! OH WOW. I love the idea of using the pumpkin in a baked good! That sounds super tasty. This is Amazing!!!! My nephew made this & after he removed the pumpkin and spices, he put them into rum & made pumpkin infused rum, also quit delicious! Finally found some sugar pumpkins! Can’t wait to have this in a latte! My dehydrated pumpkin soaked up all the bourbon. I’m starting to think I need a cider press of sorts. Any clues? Good question that I’m not sure I know the answer to. How long did you soak it for? I’d try the press but I think I’d add more liquid to the pumpkins if it’s all being soaked up. Sooooo, I used this over coffee with a tsp of sugar (more or less to taste) and then added fresh whipped cream and I added some pumpin spice when whipping it up, from Trader Joe’s. It turned into a AMAZING warm coffee drink!!!! That sounds SUPER tasty!! Glad you enjoyed it. In these days buying a sherried single malt is like playing russian roulette. Glenfarclas 15 yo is really great malt when it’s not sulfured. Unfortunately, nowadays demand is so high and sulfured sherry casks so common, that even highly respected distilleries like Glenfarclas can’t make it anymore. Only thing you can do is taste the batch first or buy “bullet proof” single cask sherry malt.